Even if you have never picked up a copy of Miguel de Cervantes’s novel The Ingenious Hidalgo Don Quixote of La Mancha, you’re doubtlessly familiar with the story: one of delusional noblemen, portly squires, and windmill monsters. Nevertheless, there could be a few little-known facts you haven’t heard about the two-volume 17th-century masterpiece. 1. DON QUIXOTE IS CONSIDERED THE FIRST MODERN NOVEL. Such esteemed thinkers as award-winning literary critic Harold Bloom and decorated novelist and essayist Carlos Fuentes have declared that Don Quixote is the very first true example of the modern novel. Bloom identifies the arcs of change bracing the story’s titular character and his companion Sancho Panza as the primary marker that distinguishes it as the first of its breed, and Fuentes suggested that the nuance in the dialogue and characterization is chief in separating Don Quixote from all preceding texts. 2. CERVANTES CAME UP WITH THE STORY WHILE HE WAS IN JAIL. Though he’d eventually go on to pen one of the most famous novels in world history, a young Miguel de Cervantes suffered from a plight familiar to any aspiring writer: working a day job to pay the bills. Among the varied gigs Cervantes kept in the years before his literary breakout was a job as a tax collector for the Spanish government. However, frequent “mathematic irregularities” landed Cervantes in the Crown Jail of Seville twice between 1597 and 1602. It was during this time in the slammer that Cervantes is believed to have first thought up the story that would become Don Quixote. 3. CERVANTES NAMED THE MAIN CHARACTER AFTER HIS WIFE’S UNCLE. Near the conclusion of the second volume of Don Quixote, Cervantes reveals the real name of his hero to be Alonso Quixano (alternatively spelled “Quijano”). He borrowed this name from Alonso de Quesada y Salazar, the great uncle of Catalina de Salazar y Palacios, whom Cervantes married in 1584. Alonso is believed to have inspired not only the name but also the general characterization of the novel’s hero. And, the name Quixote came from the word for "thigh armor." 4. CERVANTES PLUGGED DON QUIXOTE: PART II IN THE FOREWORD OF ANOTHER STORY. Cervantes released the 12-part novella collection Novelas ejemplares in 1613 after having penned the series incrementally over the eight-year span that followed the publication of the original volume of Don Quixote. A foreword to the collection not only introduced the new work, but also promised readers that Cervantes was planning a continuation of the incomplete Gentleman of La Mancha fable. (His advertisement for an upcoming book ahead of an entirely independent work could be seen as an ancestor to the modern day movie trailer.) This second volume was published two years later, in 1615. 5. A PHONY PART II WAS PUBLISHED AS A HOAX. Just one year after Cervantes’ Novelas ejemplares foreword plug, however, a volume of mysterious origin wormed its way into the Don Quixote canon. Written by an author who used the pseudonym Alonso Fernández de Avellaneda, the unofficial sequel was infamous for the feeble quality of writing and the numerous potshots it took at Cervantes and the source material. 6. THIS FAKE SEQUEL IS THOUGHT TO HAVE CONVINCED CERVANTES TO FINISH HIS OWN. Although Cervantes had already gone on record about intending to wrap up the story of Don Quixote in a second text, it is generally believed that the Avellaneda debacle was the straw that broke the camel’s back and motivated the author to transfer his intentions to the page. Cervantes was so enraged by the hoax that he wrote the existence of Avellaneda’s novel into his own Part II, maligning it for poor quality and misunderstanding of his original characters and story. 7. 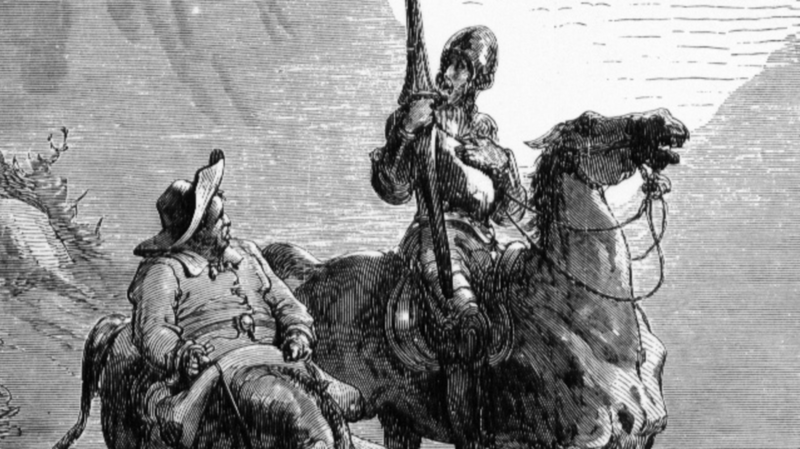 DON QUIXOTE HELPED ESTABLISH THE MODERN SPANISH LANGUAGE. The variant of the Spanish language in which Cervantes penned his novel was actually a rather new development at the turn of the 17th century and would be much more familiar to contemporary Spanish speakers than the colloquial tongue of the era. The popularity of Don Quixote cemented the modern Spanish that is now the second most commonly spoken language in the world, behind Mandarin. 8. CERVANTES DREW FROM HIS EXPERIENCES AS A SLAVE TO WRITE THE NOVEL. A particularly empathetic sequence in the novel sees the hero and Sancho Panza freeing a group of galley slaves from captivity. Cervantes’ special sensitivity to these recipients of Don Quixote’s chivalry likely stems from his own experiences in servitude in the 1570s. Cervantes spent five years as a slave in Algiers, attempting escape on more than one occasion. 9. THE NOVEL IS CREDITED FOR THE SPREAD OF A POPULAR IDIOM. 10. THE FIRST TRANSLATION OF DON QUIXOTE WAS TOO LITERAL. 11. A FAMOUS AUTHOR CITED DON QUIXOTE AS HIS FAVORITE LITERARY CHARACTER. 12. ONE ORGANIZATION DEEMED THE BOOK THE GREATEST PIECE OF LITERATURE EVER WRITTEN. 13. THE BOOK HAS BEEN TRANSLATED INTO AT LEAST 50 LANGUAGES. Today, Don Quixote boasts prints in Spanish, Catalan, Galician, Basque, Latin, English, French, Italian, Portuguese, German, Romanian, Russian, Japanese, Chinese, Korean, Thai, Tagalog, Vietnamese, Arabic, Hebrew, Persian, Hindi, Irish, Gaelic, Finnish, Norwegian, Swedish, Icelandic, Hungarian, Polish, Czech, Danish, Dutch, Greek, Turkish, Serbian, Albanian, Bulgarian, Croatian, Slovenian, Latvian, Estonian, Lithuanian, Maltese, Georgian, Esperanto, Yiddish, and Braille. 14. CERVANTES DID NOT PROFIT OFF OF THE SUCCESS OF DON QUIXOTE. 15. DON QUIXOTE MIGHT BE THE BEST-SELLING NOVEL OF ALL TIME. While the age of the novel makes it hard to fully estimate the scope of its distribution, many scholars estimate that it has reached a readership of 500 million. This figure would make it the best selling novel in world history by far, topping Charles Dickens’ A Tale of Two Cities’ 200 million count and J.R.R. Tolkien’s The Lord of the Rings trilogy’s 150 million count.